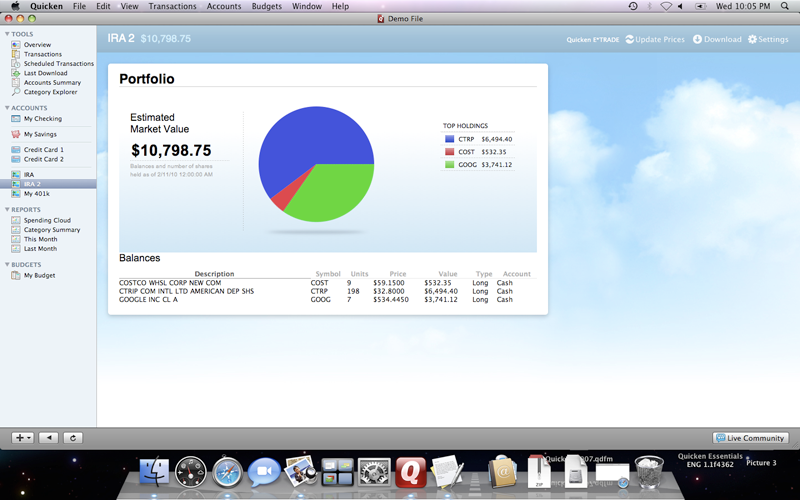 After numerous delays, Quicken's long-awaited money management software built specifically for the Mac arrived Thursday in the form of Quicken Essentials for Mac 2010. 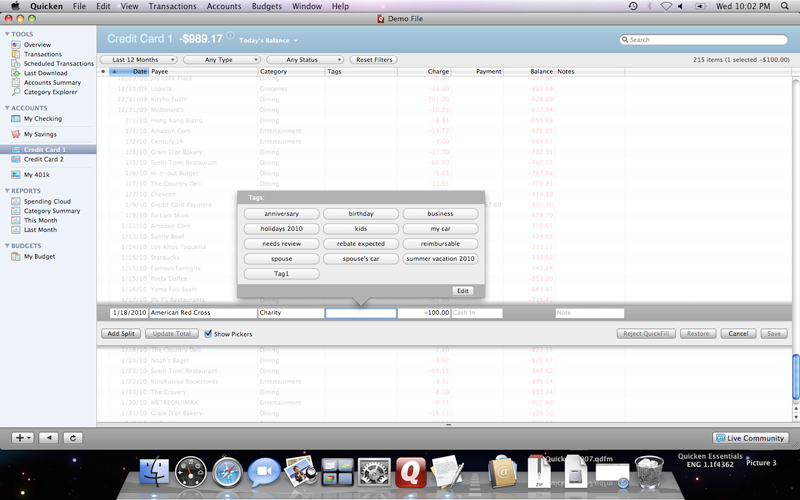 Quicken Essentials for Mac is a brand new product developed in Cocoa to optimize the Mac look and feel. It connects twice the number of banks available in the previous offering, Quicken Mac 2007, increasing from 4,000 to 8,000. The company expects to have access to 16,000 banks in the coming months. "Quicken Essentials for Mac is the first Quicken product to take full advantage of the Mac operating system and development platform," said Aaron Patzer, vice president and general manager of Intuits Personal Finance Group. "Were bringing a completely new Quicken experience to Mac users, helping them answer essential money questions  what do I spend, what do I earn, where do I stand on my budgets, what is my net worth, and where can I do better?" Quicken developer Intuit said the new product earned its name because it offers the "essentials" for the majority of people: How much money you have, how much you owe, all your liabilities and investments, and all of your budgeting. Quicken Essentials for Mac also sports easier categorization with a new learning algorithm, and also allows conversion for previous Quicken users on both Windows and Mac, as well as users of Microsoft Money. View your accounts all in one place. Our completely reimagined interface makes it easier than ever to see where you can save more and spend less. Save time and money. 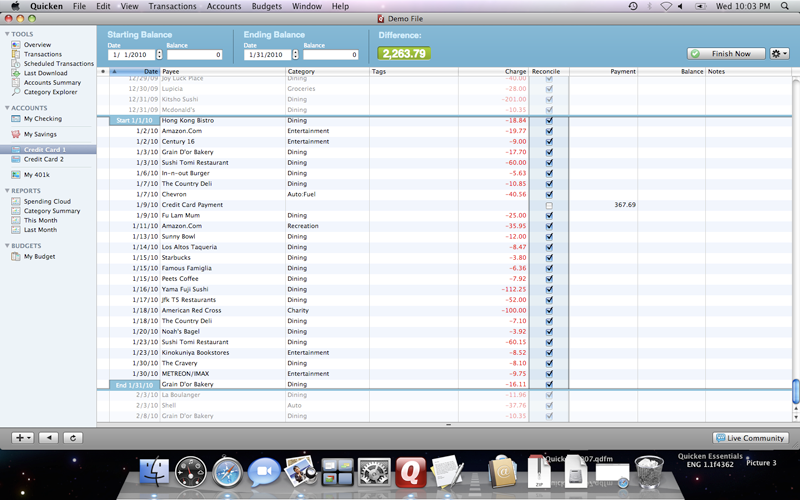 Quicken automatically categorizes transactions so you can see where your moneys going and pay down debt. Avoid pesky overdraft and late fees. See your current balance, including upcoming bills and paychecks so you always know where you stand. The new product does drop some features found in the previous version, Quicken Mac 2007, which Intuit said it will continue to support for those that rely on those capabilities. Quicken Essentials for Mac has a "light" investment feature, with a view only version that doesn't have tax lot accounting. It also doesn't do bill pay —which Intuit said only 6 percent of people used —and there is no direct integration with TurboTax. 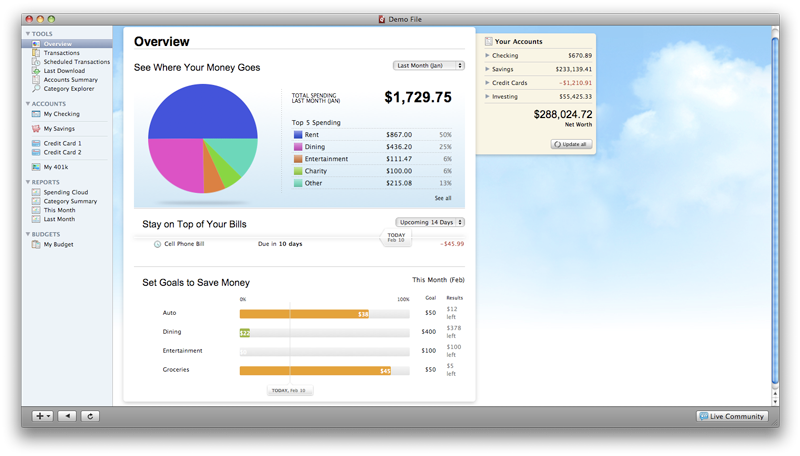 AppleInsider first previewed the Quicken overhaul more than two years ago, in January 2008, when it was then known as "Quicken Financial Life for Mac." 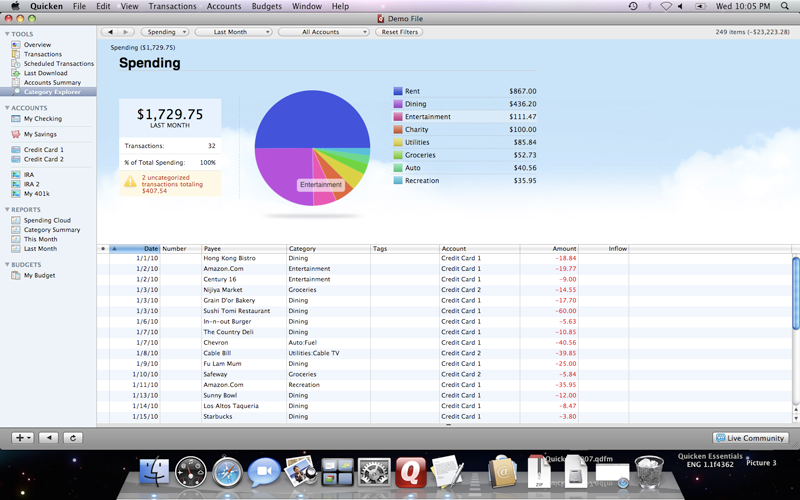 Quicken Essentials for Mac 2010 is available for $69.99 from Intuit. It is available as a direct download, or via CD-ROM.